8 April 2018: The oil spill has now spread across an area greater than the city of Paris and is heading out to the open ocean. The incident has been blamed for the deaths of five fishermen in a fire sparked by clean-up workers who were trying to clear the oil by burning it off the water’s surface. The spill stems from a pipeline operated by state-owned oil firm Pertamina in the city of Balikpapan, in East Kalimantan province. A report released April 4 by the Ministry of Environment and Forestry said the slick was spreading out from Balikpapan Bay and into the Strait of Makassar, covering some 130 square kilometers (50 square miles). Pertamina, which for days had denied responsibility for the disaster, finally admitted on April 4 that one of its pipes used for transporting crude oil was the source of the slick. 4 April 2018: Indonesia has declared a state of emergency after a large oil spill ignited and killed at least four people in the port city of Balikpapan off the island of Borneo over the weekend. Black smoke rises from a burned oil spill at the waters in Balikpapan, Indonesia, March 31, 2018. 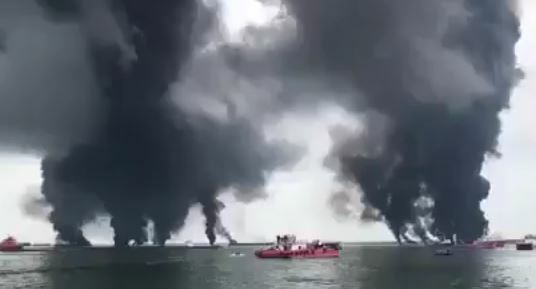 A cargo ship caught fire in waters off East Kalimantan province in central Indonesia on Saturday, leaving two people dead and two others missing, an official said. Hundreds of locals have reported health issues including difficulty breathing, nausea and vomiting from the smell of fuel and black smoke. The blaze is now under control but the oil continues to spread. According to BBC News, the slick currently covers an area of seven square miles and threatens to further pollute the waters.